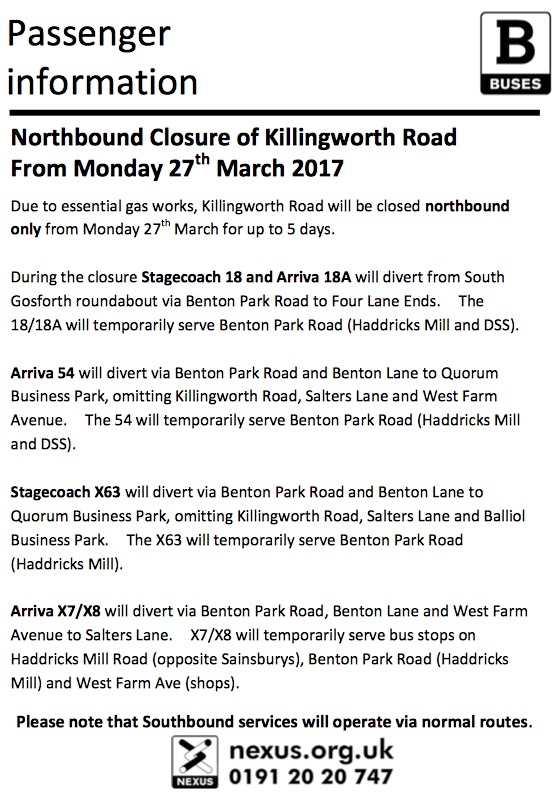 Due to essential gas works, Killingworth Road will be closed northbound from Monday 27th March for up to 5 days, and then for a longer period later in the year when the Metro bridge is due to be replaced. For those that wish to (or have to) drive the advice is to leave extra time for your journey. Below are some alternative options if you don’t need to take your car. Metro Park and Ride at Kingston Park and Northumberland Park Metro stations. Great Park and Ride by bus from the Great Park just off the B1318 junction from the A1. By rail it takes between 17 and 25 minutes from Morpeth or 17 minutes from Cramlington to Newcastle Central Station, though services are currently relatively infrequent. For destinations south of Newcastle by car it is likely to be quicker to use the A1 or A19. For more local journeys, if you can find a route you are comfortable with, it would take about 20 minutes to cycle from pretty much anywhere within the dashed green line to the City Centre. Nexus have a journey planner covering bus and metro travel. Alternatively Google Maps provides route options for walking, cycling and bus travel in addition to driving directions. Live departure information for buses and the Metro is also available on the Nexus Live Map. For people living in or near Garden Village, this map shows walking and cycling times to nearby Metro stations. The Metro footbridge immediately south of Salters Bridge has steep steps and no ramp so isn’t suitable for wheelchairs or pushchairs. Bus routes 18, 18A, 54, X7/X8 & X63 will be affected by the northbound lane closure as Nexus have set out below. Detailed information on bus changes can be found on the Nexus Service Status webpage. Can protected cycle lanes be good for business? 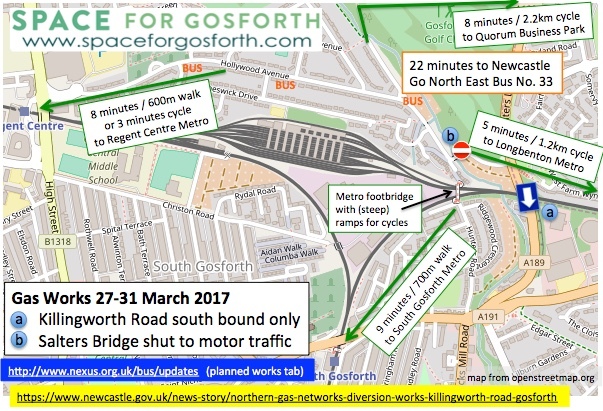 This entry was posted in Blue House, Public Transport and tagged Garden Village, Killingworth Road, Salters Bridge on March 24, 2017 by SPACE for Gosforth. 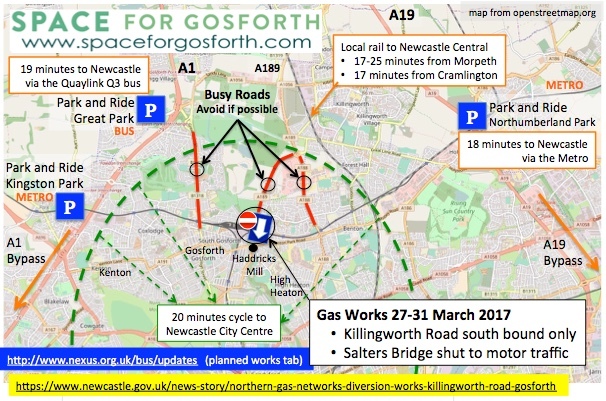 Just cycling from Gosforth is as fast as Metro or bus, and possibly faster as you cut the waiting allowances and go door to door, plus of course it is likely that you can get past the works along access that remains for pedestrian traffic. Why wasn’t this suggested? Unfortunately at this notice there is no opportunity to suggest a local offer of a rebirth of Scratchbikes as these would be brilliant solution, and might also be an option for when parts of the Metro are closed for track renewals. So check out the plans for signage of the works (Chapter 8) and the arrangements for pedestrian traffic – including prams and wheelchairs, and at least 1.5m wide. Likewise for cycling, although perhaps with some parts where cyclists may have to walk. Then make sure this is delivered, as prescribed by the book.